In the Buddhist model of how people experience the world, craving and aversion are both mental states to be avoided, because they lead to an experience of suffering. “Craving” is simply the outcome of the belief, held by most people, that sounds something like “getting what I want will make me permanently happy”. Conversely, “aversion” is the flip side of this, and comes from the belief that “avoiding what I don’t want will make me permanently happy”. These can both be encapsulated under the concept of “tanha”. In a past article, I expanded on these concepts and devised four different categories based on whether the feeling arose from craving or aversion, and from an orientation toward the future or to the past. Fear is just a negative story that we tell ourselves about the future. It’s the anticipation or expectation that the “future” is going to be “bad”, for some timeframe of “future” and some kind of “bad”. In some cases – usually motivated at the basic level of genetics – telling this kind of story is actually useful because it motivates us to act. When we see a bear moving quickly toward us, our fight or flight instinct kicks in because we are descended from people who reacted in pessimistic and fearful ways when they met bears behaving this way. Most of the cavemen who thought that fast-moving bears were lovable furballs were eaten and didn’t get to pass on their genes. This lives on in a understanding deep within the brain that things moving quickly toward us are potentially dangerous (“Whoa, that car was a little close to the sidewalk…”). Unfortunately, we see this kind of encoded reaction in a lot of other areas that aren’t actually dangerous any more. When we used to live in little tribes of 100-200 people, social disapproval was a true death sentence – exile from the tribe meant that your source of personal, bodily survival (food, water, fire, shelter) and genetic survival (ability to reproduce) was wiped out. No wonder primates are social creatures who are largely afraid to go against the status quo. Of course, fear can be taught culturally as well, through themes in literature and entertainment. Anyone who’s seen a couple of horror movies knows that when the hot girl goes to the basement to check out the “mysterious noises”, bad things will probably follow. The bottom line: whether genetic, deeply conditioned, superficial, or a total illusion, the experience of fear is just a story that we tell ourselves about something going wrong in the future. It’s just a thought. It’s not real. In opposition to fear, hope is just a positive story that we tell ourselves about the future. It’s the anticipation or judgment that the “future” is going to be “good”, for some timeframe of “future” and some kind of “good”. So, hope is a good thing, right? Who could possibly be against hope? In fact, hope can be unhealthy when it’s used to avoid engaging with the reality of the present moment and to escape to an desired but illusory future. In theory it’s good to be optimistic about the future. However, it’s better if such optimism comes from total involvement in our present moment actions and thoughts, rather than “wishful thinking” about some hypothetical future that we’re doing nothing to bring about. Instead of telling a story about a potential future, it’s better to work in the present moment in the most intelligent possible way to actually make that future happen. As with fear, hope is just a thought. It’s not real. All that we have experienced – or think we have experienced – lies somewhere in our memory. When we despise or reject certain parts of what seems to be our “story”, then we split off parts of ourselves and push away portions of our unconscious minds. This can cause great stress, mysterious psychological difficulties, and great unhappiness. This is what happens when we live in a state of regret, and it’s not pretty. Being in a state of aversion about some part of our memory is counterproductive. Instead of pushing upsetting memories away, or pretending that they aren’t there, it’s better to either make peace with them, or else to reinterpret them in a way that eliminates their power to upset us in the present moment. As Richard Bandler says, “the best thing about the past is that it’s over”. Because of this, there’s no reason why we need to feel sad in the present about anything that happened in the past. Often, we don’t realize that the process of forming a memory deletes, distorts and generalizes “what actually happened”. Furthermore, the process of recalling a memory actually rewrites and changes the memory itself. In other words, in a very literal way, our memories aren’t what they used to be. In fact, through various forms of therapy, coaching, and changework, it’s possible to alter our responses to previously troubling memories so that the past no longer has the ability to influence our present moment experience. Regret is just a thought. It’s not real. In contrast with bad memories, things that we regret, we like to hold on to good memories. This is the state of nostalgia. We want the memories to stay the same, and enjoy replaying them in our minds, in an attempt to capture the experience over and over again. When we wish to avoid the present moment, we often seduced into telling ourselves pleasant stories about the past. Unfortunately, this process, even if it feels pleasant and comfortable, takes us out of present-moment awareness and removes our ability to function and take action right now. As such, a state of nostalgia is counterproductive to true present moment happiness, because it is a state of craving for something which is no longer present. Even though it may seem counterintuitive, full engagement with the present moment, even if we’re doing an activity that is less enjoyable than something we remember from the recent past, is the real key to happiness. In contrast, nostalgia is just a thought. It’s not real. The key point is that it’s best for our well being to allow our minds to remain in the present moment. Even if we have happy feelings about our past and positive plans for the future, we don’t get anything done in the present by focusing our attention on times other than now. Also, in practice, most people with habitual thinking that is out of balance with the present moment don’t always think positively. Telling stories about a positive future can often lead to fears of a negative future, because the future is unknown. Telling stories about a positive past can trigger other stories about a negative past, since memories are interlinked in mysterious and complex ways. 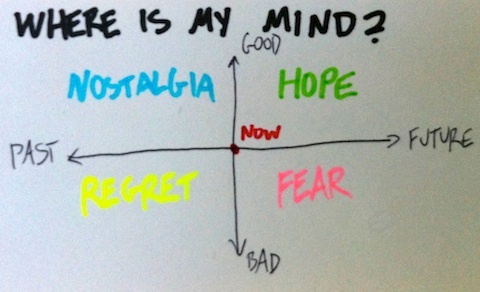 Being out of alignment with the present is inevitably unstable, and the “monkey mind” oscillates from one quadrant to another unpredictably. In the process of meditation and other mental and spiritual practices, people often use the words “centered” or “balanced”. As you revisit the diagram, and pause for a moment, and think about what these words mean, this starts to make perfect sense. Living in the present moment – now – and accepting reality exactly as it is without judgment or evaluation, is simply the process of allowing your mind to remain at the intersection point of the two arrows, in the center of the picture. This represents being centered or balanced in two different ways. The first is being centered in time, being concerned with neither future nor past. The second is being centered in your evaluations about your stream of experience, not saying “this is good” and “this is bad” but instead loving what is and embracing it without judgment. Being balanced in both of these ways is the key to actual happiness. This is an excellent article. This is something that has been nagging me lately and this explains why. I’m constantly thinking about how to improve myself and thinking about future events when in reality, I need to put all that aside and concentrate all my efforts now. ( my dream to be a professional golfer keeps putting me down when I realize the massive amount of work that has to be done to get to the level) That’s really the only way I’m going to get to where I would like to be.